The image below shows that Arctic sea ice had reached a level of 4.45 million square kilometers on September 16, 2015 (end of dark blue line at center of image). 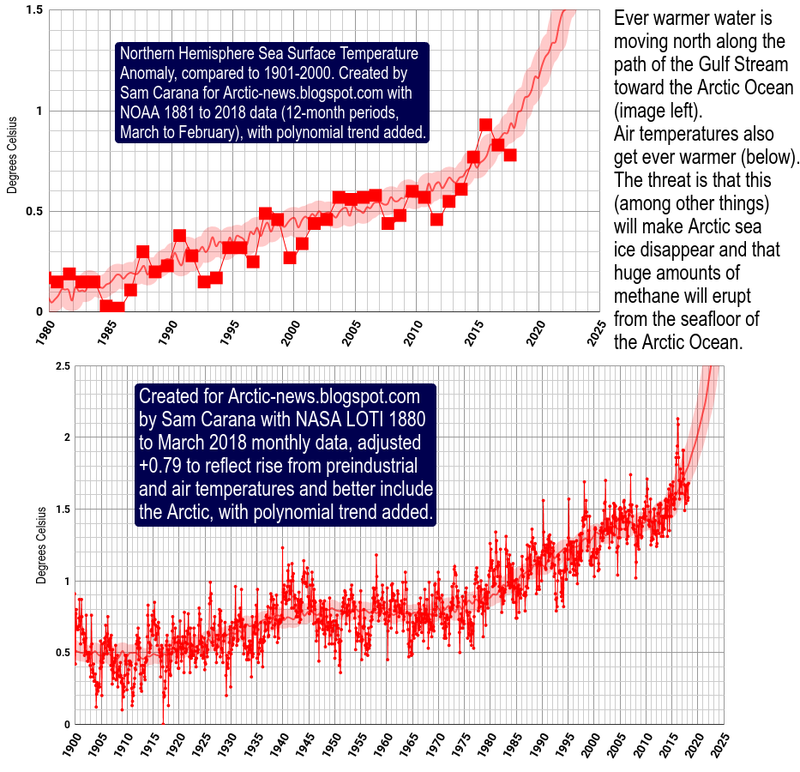 NSIDC has meanwhile called the 2015 minimum, but the first sentence of their post hastens to add that on September 11, Arctic sea ice reached its likely minimum for 2015, at 4.41 million square kilometers (1.70 million square miles), putting 2015 in the fourth lowest place since satellite records began. Arctic sea ice minimum was lower only in 2012 (dotted line), 2007 (light blue line) and 2011 (orange line). Sea ice extent was 4.413 million square kilometers both on September 9, 2015, as well as on September 10 and 11, 2015. September 9 would be early for the sea ice to reach its minimum, as a comparison with earlier years on above image illustrates. The dark blue line on above image shows that sea ice extent fell slightly on September 16, compared to the day before, and is now below the 2011 extent (orange line) for this time of the year. Over the next few days, sea ice extent may well fall somewhat further, and reach a level below the 2011 minimum, thus reaching the third lowest minimum extent since record began. This could eventuate due to winds compacting the sea ice. More importantly, sea ice thickness is still falling, as illustrated by the image below showing the sea ice thickness on September 9 in the left panel and a forecast for thickness on September 24 in the right panel. The image below compares sea ice thickness between September 24, 2012 (left panel) with that forecast for September 24, 2015 (right panel). Above image illustrates why the situation in 2015 is even more threatening than it was in 2012. Only the ice that is colored light green, yellow and red is more than 3 meters thick. In 2015, ocean heat has been melting the sea ice from underneath. So, even while the currently lower temperatures of the air may have resulted in a slight increase in extent over the past week, the added ice is very thin. Ocean heat first of all goes into melting the thickest sea ice, i.e. the parts that are meters below the surface. This because the water at surface level is colder than the water underneath the surface. This explains why much of the water surface will remain covered by (very thin) ice as air temperatures are now falling (compared to air temperatures over the past few months). 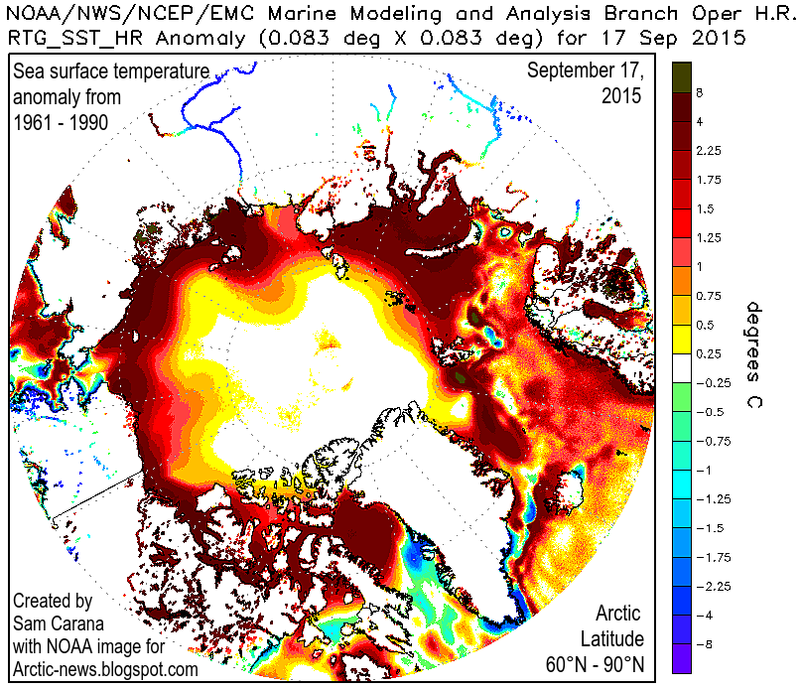 The image below shows sea surface temperatures as at September 17, 2015. In conclusion, while the sea ice appears to have survived the 2015 melting season without collapsing, the threat that this will occur in the coming years is ominous. 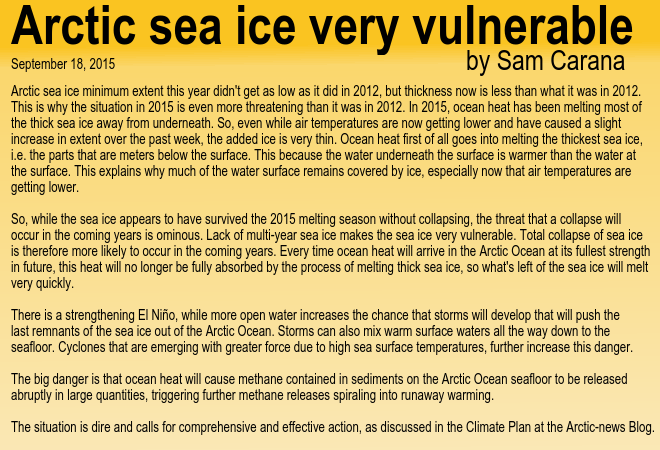 Lack of multi-year sea ice makes that sea ice is in a very vulnerable situation. 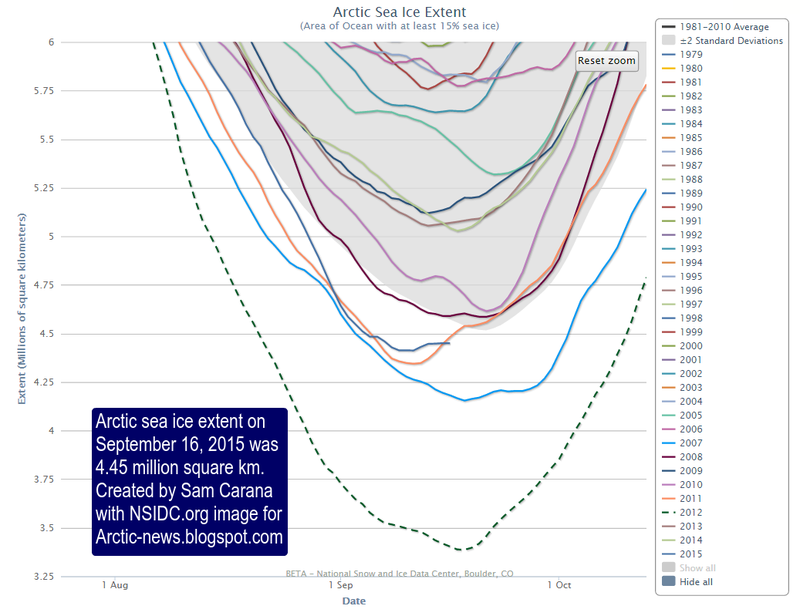 Total collapse of sea ice is therefore more likely to happen in the coming years. Every time ocean heat will arrive in the Arctic Ocean at its fullest strength in future, this heat will no longer be able to be fully absorbed by the process of melting thick sea ice, so what's left of the sea ice will melt very quickly. There is a strengthening El Niño, while more open water increases the chance that storms will develop that will push the last remnants of the sea ice out of the Arctic Ocean, as discussed in earlier posts such as this one. Storms can also mix warm surface waters all the way down to the seafloor, as discussed in this earlier post. Cyclones that emerge with greater force due to high sea surface temperatures further increase this danger. 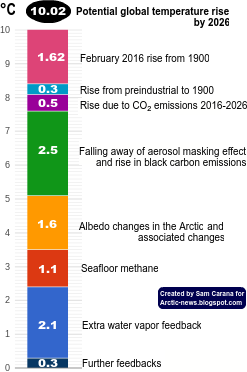 The big danger is that ocean heat will cause methane contained in sediments on the Arctic Ocean seafloor to be released abruptly in large quantities, triggering further methane releases spiraling into runaway warming. Below is a text-only version of this post for radio.